Pirates & Privateers : I'm a writer and I would like to know whether there are very specific first names of pirates or there are some that would be better. And the last names? Thank you for your cooperation! Question of Maureen - Nyn B. (04.19.2016): I'm a writer and I would like to know whether there are very specific first names of pirates or there are some that would be better. And the last names? Thank you for your cooperation! A: You can see the names of the crew of Blackbeard a.k.a. Edward Teach (or Drummond) at this link. 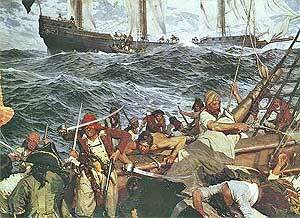 Here is in particular the list of the crew of Edward Low. The full names are more mundane. But bear in mind that many pirates preferred to use nicknames. These nicknames were not all wacky, like Blackbeard (Edward Teach), the Exterminator (Monbars), La Buse (Olivier Levasseur), Calico Jack (John Rackham), etc ... there were some common names invented to leave no trace of their past, because they were often thieves, former Royal Navy (which inflicted harsher punishments than its soldiers did as pirate captains) and other criminals. © Painting: Frederick Judd Waugh "The Buccaneers"